Used as a way of protecting your gear at a campsite, as a covering over your tent, or in lieu of a tent, a fire retardant camp tarp is a handy item to own. What makes it nice, too, is that it can be conveniently constructed for whatever your need happens to be. There are dozens of camping tarps available, but how many of them are fire retardant? Most claim to be waterproof and that is all. What makes a tarp fire retardant? Fire retardant tarps are woven from a tight weave mesh, and made of neoprene-coated nylon, (DuPont's trade name for a family of synthetic rubbers made with polychloroprene), canvas, or vinyl laminated nylon. They do not combust and resist the spread of flames. Tarps come in many colors and sizes. Most of them are also ultra-violet (UV) resistant so that they won't fade in sunlight. Fire resistant and retardant tarps have to meet certain requirements or they can't claim to be retardant. Check to make sure they are up to standard. For example, an advertisement for a 10 foot by 10 foot tarp sold in California has on its tag: Meets CPAI-84, NFPA 71, and CA Title 19 requirements. Tarps can often be purchased at hardware stores as well as stores that sell camping and outdoor items. They are less expensive than tents, another reason many use them instead of tents. Retail prices run from $35 to $100 each. What are some uses for a fire retardant camp tarp? Using galvanized steel poles, some rope and tie-downs, you can set up a place to sleep. Carrying a tarp and a few lightweight poles will cut the weight of your backpack by about two to three pounds. Many opt to either use hiking poles or trekking poles to set up the tarp. Some prefer stretching out the tarp, and tying rope or lightweight cord through the grommets and then around limbs or trunks of trees to secure the structure. If this last method works for you, poles aren't even needed. 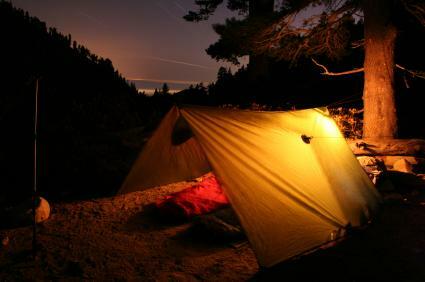 As for sleeping under a camp tarp, an advantage is that you will be more out in the open. One disadvantage is that you might not be as warm or dry or free from insects and other critters as you would be in a sealed and zippered tent. If you want to be certain your sleeping bag won't get wet under the tarp, use a sleeping bag cover and you'll stay dry. With some extension poles and rope you can create a sun room where you can sit in your folding camping chairs and watch the world go by. Or use your camping stove under the tarp to cook up a meal. This is something you can't do in a tent. In spite of rain, you can enjoy your meal without getting wet. Even if you don't want to sleep under the tarp and prefer tent sleeping, a tarp is still handy and worth setting up. Using poles and rope, set up the tarp to create a dry shelter where you can place your camping gear--stove, sleeping bags, chairs and lanterns--protecting everything from rain. If a campsite has a built-in table, some like to place the tarp over the table (securing it with cord around nearby trees) so that they can put their gear on the tabletop and have the tarp cover it. You will need to find two trees about 10 feet from each other. String a lightweight cord or piece of rope between the trees three to four feet off the ground. Place the tarp over the cord lengthwise. Place a stake at each corner so that the tarp will be grounded. You can then enter and exit the tarp through the "A" at either end. Lay the tarp out on the ground between four trees or sturdy poles (at least five feet high). The trees should circle the tarp. String cord or rope through the grommets and tie the cord around the trunks or broad limbs of the four trees. Be creative! As long as you have some patience and some rope or cord, you can set your camp tarp up and enjoy your camping experience. Be sure to bring along plenty of cord, a knife or scissors to cut with, and a great attitude!